Leslie Claire Margaret Caron (French: [lɛsli kaʁɔ̃]; born 1 July 1931) is a Franco-American film actress and dancer who has appeared in 45 films between 1951 and 2003. Her autobiography, Thank Heaven, was published in 2010 in the UK and US, and in 2011 in a French version. Veteran documentarian Larry Weinstein's Leslie Caron: The Reluctant Star premiered at the Toronto International Film Festival on June 28, 2016. Caron is best known for the musical films An American in Paris (1951), Lili (1953), Daddy Long Legs (1955), Gigi (1958), and for the nonmusical films Fanny (1961), The L-Shaped Room (1962), and Father Goose (1964). She received two Academy Award nominations for Best Actress. In 2006, her performance in Law & Order: Special Victims Unit won her an Emmy for guest actress in a drama series. She is fluent in French, English, and Italian. She is one of the few dancers or actresses who have danced with Gene Kelly, Fred Astaire, Mikhail Baryshnikov and Rudolf Nureyev. Caron was born in Boulogne-sur-Seine, Seine (now Boulogne-Billancourt, Hauts-de-Seine), the daughter of Margaret (née Petit), a Franco American dancer on Broadway, and Claude Caron, a French chemist, pharmacist, perfumer and boutique owner. While her older brother Aimery Caron became a chemist like their father, Leslie was prepared for a performing career from childhood by their mother. Caron started her career as a ballerina. Gene Kelly discovered her in the Roland Petit company "Ballet des Champs Elysées" and cast her to appear opposite him in the musical An American in Paris (1951), a role in which a pregnant Cyd Charisse was originally cast. This role led to a long-term MGM contract and a sequence of films which included the musical The Glass Slipper (1955) and the drama The Man with a Cloak (1951), with Joseph Cotten and Barbara Stanwyck. Still, Caron has said of herself: "Unfortunately, Hollywood considers musical dancers as hoofers. Regrettable expression." She also starred in the successful musicals Lili (1953), with Mel Ferrer; Daddy Long Legs (1955), with Fred Astaire, and Gigi (1958) with Louis Jourdan and Maurice Chevalier. In 1953, Caron was nominated for an Academy Award for Best Actress for her starring role in Lili. For her performance in the British drama The L-Shaped Room (1962), she won the BAFTA (Best British Actress) and Golden Globe awards, and was nominated for the Best Actress Oscar. In the 1960s and thereafter, Caron worked in European films, as well. Her later film assignments included Father Goose (1964), with Cary Grant; Ken Russell's Valentino (1977), in the role of silent-screen legend Alla Nazimova; and Louis Malle's Damage (1992). Sometime in 1970, Caron was one of the many actresses considered for the lead role of Eglantine Price in Disney's Bedknobs and Broomsticks, losing the role to British actress Angela Lansbury. In 1967, she was a member of the jury of the 5th Moscow International Film Festival. 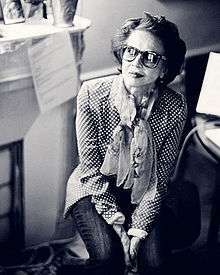 In 1989, she was a member of the jury at the 39th Berlin International Film Festival. Caron has continued to act, appearing in the film Chocolat (2000). During the 1980s, she appeared in several episodes of the soap opera Falcon Crest as Nicole Sauguet. She is one of the few actresses from the classic era of MGM musicals who are still active in film—a group that includes Debbie Reynolds, Dean Stockwell, Rita Moreno, Margaret O'Brien, and June Lockhart. Her other recent credits include Funny Bones (1995) with Jerry Lewis and Oliver Platt; The Last of the Blonde Bombshells (2000) with Judi Dench and Cleo Laine; and Le Divorce (2003), directed by James Ivory, with Kate Hudson and Naomi Watts. On 30 June 2003, Caron traveled to San Francisco to appear as the special guest star in The Songs of Alan Jay Lerner: I Remember It Well, a retrospective concert staged by San Francisco's 42nd Street Moon Company. In 2007, her guest appearance on Law and Order: Special Victims Unit earned her a 2007 Primetime Emmy Award. On 27 April 2009, Caron traveled to New York as an honored guest at a tribute to Alan Jay Lerner and Frederick Loewe at the Paley Center for Media. On 8 December 2009, Caron received the 2,394th Star on the Hollywood Walk of Fame. In February 2010, she played Madame Armfeldt in A Little Night Music at the Théâtre du Châtelet in Paris, which also featured Greta Scacchi and Lambert Wilson. in 2016 Caron appeared in the ITV television series The Durrells as the Countess Mavrodaki. 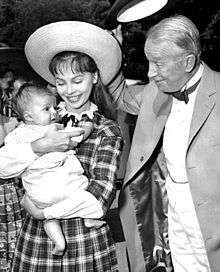 In September 1951, Caron married American George Hormel III, a grandson of the founder of Hormel (a meat-packing company). They divorced in 1954. Her second husband was British theatre director Peter Hall. They married in 1956 and had two children: Christopher John Hall (TV producer) in 1957 and Jennifer Caron Hall, a writer, painter, and actress, in 1958. Caron had an affair with Warren Beatty (1961). When Hall and she divorced in 1965, Beatty was named as a co-respondent and was ordered by the London court to pay "the costs of the case." In 1969, Caron married Michael Laughlin, best known as producer of the film Two-Lane Blacktop; they divorced in 1980. Her son-in-law is Glenn Wilhide, the producer and screenwriter. Caron was also romantically linked to Dutch television actor Robert Wolders from 1994 to 1995. From June 1993 until September 2009, Caron owned and operated the hotel and restaurant Auberge La Lucarne aux Chouettes (The Owls' Nest), located in Villeneuve-sur-Yonne, located about 130 km (81 mi) south of Paris. In her autobiography, Thank Heaven, she states that she became an American citizen—evidently based on her mother having been born in the United States—in time to vote for Barack Obama for president. 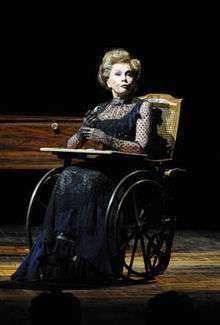 Leslie Caron, A Little Night Music by Stephen Sondheim, théâtre du Châtelet, 2010. ↑ Kisselgoff, Anna (12 March 1995). "DANCE; The Ballerina In Leslie Caron The Actress". New York Times. ↑ "5th Moscow International Film Festival (1967)". MIFF. Retrieved 9 December 2012. ↑ "Berlinale: 1989 Juries". Berlinale. Retrieved 9 March 2011. ↑ "The Musicals of Lerner & Loewe: An Evening of Song and Television". The Paley Center for Media. 27 April 2009. ↑ "Leslie Caron Receives Walk of Fame Star". CBS 2 / KCAL 9. Los Angeles. 8 December 2009. ↑ Rich, Frank (3 July 1978). "Warren Beatty Strikes Again". Time. ↑ "Leslie Caron". TCM Movie Database. Retrieved 11 November 2008. ↑ "French inn: Her latest stage". Los Angeles Times. 15 October 2006. ↑ Caron, Leslie (25 November 2009). Thank Heaven: A Memoir. New York: Viking Adult. Wikimedia Commons has media related to Leslie Caron.